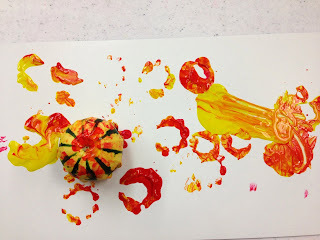 Use the pumpkin to transfer paint to the cardboard or paper. They can swipe it around like a regular paintbrush, or press-and-lift like a rubber stamp. Or just paint the pumpkins! Some kids even left out the pumpkin and just painted with their hands. --I had originally intended to give them all three primary colors to work with, but in the end, I'm glad I stuck with just red and yellow. It reinforces the concept that those two colors make orange, plus all the resulting shades are just so lovely and autumnal! --This was a quick project for every class session. Most kids only engaged with the project for a short period of time before they were ready to go wash their hands. But that didn't necessarily mean they didn't enjoy the project, just that it didn't take long to fill up that piece of cardboard with such a big "brush"!